Born on 29 September 1892 in Wyman, Quebec - son of the late Mr. and Mrs. A.R. Gallaway - brother of Alfred Gallaway, Westmeath, Ontario - at the time of his enlistment in 1916: present address in Wyman, Quebec, trade as farmer, single, no current or previous military service, Church of England, height of 5 feet 6.5 inches, weight of 135 pounds, chest of 38.5 inches fully expanded, ruddy complexion, blue eyes, dark brown hair. 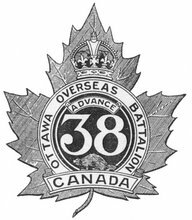 Joined the 130th Battalion, CEF, in Arnprior, Ontario, on 19 February 1916 (number 788289) - taken on the strength of the 38th Battalion, CEF, on 14 or 15 November 1916 - killed in action on 9 April 1917 - name inscribed on the Vimy Memorial, France. (Updated with a photo of Pte Gallaway's inscription on the Vimy Memorial that I took in August 2012).